What Are Some Nutritional Recommendations for Managing PCOS? Welcome back friend to Part 3 of my PCOS Series! If you haven’t already read Part 1: Intro to PCOS and Part 2: 3 Categories of PCOS then make sure you click the links and get familiar with the most common female hormonal imbalance in North America. Today I’m going to share with you some nutritional strategies I’ve used to manage my own PCOS symptoms for the last 7 years and which I share with my clients on a regular basis. One of my absolute all-time favourite recommendations for PCOS is to drink 1 cup of spearmint tea every day. This study found that drinking spearmint tea every day for 30 days lowered testosterone levels and helped boost LH and FSH. Plus it just tastes so good. I combine it with peppermint, raspberry leaf, and nettle to make a delicious, lady-lovin’ tea blend! As with any sort of imbalance in the body, I always recommend eating an anti-inflammatory style diet that is low in refined carbohydrates and grains, inflammatory oils, and dairy. You want to aim to eat lots of veggies, fruits, fish, nuts, seeds, legumes, whole grains (if you tolerate them! ), and ethically sourced animal products. As always, please make sure that you work with your doctor or qualified healthcare practitioner before making any changes to your diet or lifestyle. These are general guidelines and not personalized for your own individual situation. I will be focusing most of the following sections on Type 1 PCOS as it has the strongest link to proper nutrient intake. I will offer a couple simple recommendations for Types 2 and 3, but working with someone knowledgable on these causes is always your best bet. A good rule of thumb is that for Type 2you would want to follow an adrenal fatigue protocol and support with stress management, adequate nutrition if undernourished, and decreased exercise if it is contributing to stress. A rule of thumb for Type 3 (which is often seen in conjunction with Type 1 or 2) is to support the thyroid and ensure the digestive tract is functioning optimally if Hashimoto’s thyroiditis is diagnosed. I will provide a brief outline below of nutrients and courses of action for Types 2 and 3, but the majority of my recommendations will be for individuals diagnosed with Type 1 PCOS, which is caused by improper blood sugar regulation and excess insulin production leading to an overproduction of testosterone by the ovaries. Type 1 PCOS has perhaps the most obvious connection with nutrition and proper nutrient intake in terms of prevention and treatment. Since this type of PCOS stems mainly from improper blood sugar regulation and excess insulin secretion, specific dietary protocols focused on low glycemic eating, high fibre intake, minimum of 1 gram of protein per kg of body weight/day, and intake of proper fats, such as omega-3s, to prevent or reverse inflammation are the standard. Below are details on specific serving sizes and daily-recommended intakes for Type 1 PCOS. The most important thing an individual with Type 1 PCOS can do is to limit the amount of carbohydrates they consume on a daily basis, specifically in the form of refined sugar or grain products. When carbohydrates are consumed they should be in whole forms and combined with adequate fibre and protein. Studies show that diets which contain the ratio of 30% good fats, 30% protein, and 40% carbohydrate from proper sources (unrefined!) is beneficial for individuals with blood sugar management issues (Balch 375). Less insulin secretion—less testosterone produced by the ovaries—fewer PCOS symptoms and the return of a regular menstrual cycle. As mentioned above individuals with blood sugar regulation issues should consume approximately 30% of their calories or ~1g/kg/day from high quality protein sources. Protein helps slow the release of food from the stomach leading to a gradual increase in blood sugar. You can get protein from fish & seafood, poultry, ruminants (beef, lamb, etc. ), nuts, seeds, and legumes. Certain fats, such as poly or monounsaturated fats can have beneficial effects on inflammation in the body. Since many individuals with blood sugar and insulin management issues also suffer from inflammation, a therapeutic intake of omega-3 fats, especially from sustainable cold-water fish sources, will help decrease systemic inflammation and by extension help rebalance hormones. Note: for vegans or vegetarians who do not consume fish, seed oil sources (hemp, flax, camelina) of omega-3s can also be taken though the conversion from ALA to EPA/DHA can be somewhat low in some people. Vegans and vegetarians should also ensure that their omega-3 seed oils do not contain a high proportion of omega-6 fats and that the rest of their diet does not contain too high a proportion as too much of this oil can promote inflammation in susceptible individuals. Alpha-lipoic-acid is also recommended as it helps control blood sugar levels. Different micronutrients (vitamins, minerals, antioxidants) can help the body process blood glucose more efficiently, lower body-wide inflammation, and help regulate the endocrine system. Below are just a few nutrients (and where you can find them!) that can be most beneficial when it comes to managing PCOS. Chromium picolinate improves the efficiency of insulin by interacting with the cellular receptors that enhance the body’s response to it. Increased insulin sensitivity helps lower blood sugar levels (Balch 373). Biotin has been shown to enhance insulin sensitivity and increase the activity of glucokinase, which is the enzyme that is responsible for the first step in glucose metabolism in the liver (Murray 419). Vitamin E may help reduce oxidative stress associated with blood sugar fluctuations, and therefore improve physical characteristics of membranes and related activities in glucose transport (Murray 420). Unrefined, cold pressed nut and seed oils—i.e. rice bran, almond, etc. (Haas 102). Zinc is involved in almost all aspects of insulin metabolism, such as synthesis, secretion, and utilization and so is a beneficial mineral for those with blood sugar and insulin imbalances (Murray 421). Nuts and seeds, especially pumpkin. 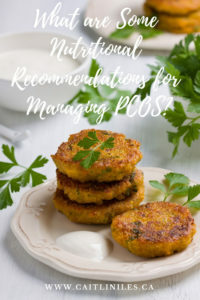 Now that we’ve taken a look at the major recommendations for Type 1 PCOS, I want to briefly touch on some of the foods and lifestyle tips that can help with the root cause (generally chronic physical and emotional stress!) of Type 2. The importance of nutrients in this type of PCOS will vary from person to person depending on the source of their stress. Some individuals may need to consume overall more calories from a variety of sources while some may already be eating enough nutrient dense food, but require a lesson in stress management. For Type 2 PCOS, the recommendations will mostly be made to support adrenal function. You’ll also want to make sure you’re getting adequate magnesium (see above!) as the adrenal glands love magnesium and use a lot when you’re under stress. There’s also a place for adaptogenic herbs such as maca or ashwagandha. I’ve got lots of yummy recipes that use both! This form of PCOS can often be found in conjunction with either of the previous types, but the thyroid is likely the most impacted organ. Nutrients important for the management, prevention, or treatment of Type 3 PCOS are those which have been shown to support the thyroid gland such as iodine. You will also want to take a look at the health of your digestive tract to make sure you’re not suffering from leaky gut! Whew! That was quite the post! Hopefully you’re feeling a little more educated and empowered when it comes to your hormonal health and delicious ways to help get the nutrients you need to manage your symptoms. If you’re looking for some extra support you can always check out my coaching packages right here! Or a great way to start balancing your hormones is via an anti-inflammatory diet, so I’ve put together a FREE 7-Day Anti-Inflammatory Meal Plan & Shopping List that you can download right here. As always, thank you for all your love and support!